The tropical cyclone known as Jebi has intensified into a super typhoon and NASA's Terra satellite found it was undergoing eyewall replacement. Terra found powerful storms around the 15 nautical-mile wide eye in this Category 5 storm. When Terra passed over Super Typhoon Jebi it appeared to be undergoing eyewall replacement. Mature, intense tropical cyclones can and often undergo an eyewall replacement cycle. That happens when a new eyewall or ring of thunderstorms within the outer rain bands forms further out from the storm's center, outside of the original eye wall. Then, that outer ring of thunderstorms chokes off the original eye wall, starving it of moisture and momentum. Eventually, if the cycle is completed, the original eye wall of thunderstorms dissipates and the new outer eye wall of thunderstorms contracts and replace the old eye wall. The storm's intensity can fluctuate over this period, initially weakening as the inner eye wall fades before again strengthening as the outer eye wall contracts. On Aug. 31 at 7:15 a.m. EDT (1150 UTC) the Moderate Resolution Imaging Spectroradiometer or MODIS instrument aboard NASA's Terra satellite found the coldest temperatures of the strongest thunderstorms around Jebi's eye and west of the center. They were as cold as or colder than minus 80 degrees Fahrenheit (minus 62.2 Celsius). Those powerful storms were embedded in a large area of storms where cloud top temperatures were as cold as or colder than minus 70 degrees Fahrenheit (minus 56.6 degrees Celsius). NASA research has shown that storms with cloud top temperatures that cold (that are very high in the troposphere) have the capability to generate heavy rain. 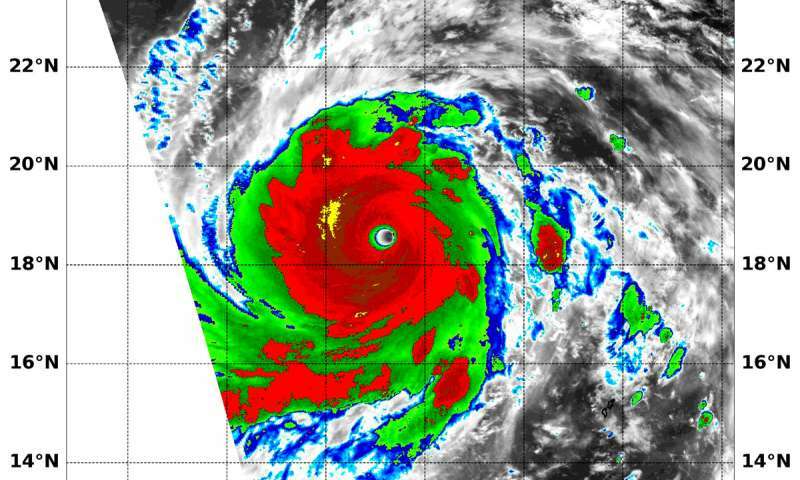 At 11 a.m. EDT (1500 UTC) Super Typhoon Jebi's maximum sustained winds were near 172 mph (150 knots/278 kph). Jebi's eye was centered near 18.8 degrees north latitude and 141.0 degrees east longitude, or about 316 nautical miles northwest of Saipan. Jebi was moving to the west-northwest at 14 mph (12 knots/22 kph).